The Story: Jimmy Finnigan lives in a ‘nice’ village but he is warned about going into the wild woods. When Jimmy discovers Dad’s old records he becomes a musician and decides to start a band but the villagers tear down his posters. So Jimmy ventures towards the wild woods where he discovers a group of animals playing instruments. A wild wood band is formed but how will the villagers react? Jimmy’s village is just too perfect so when Jimmy starts to make music it’s frowned upon and his efforts to create a band are thwarted by the villagers. 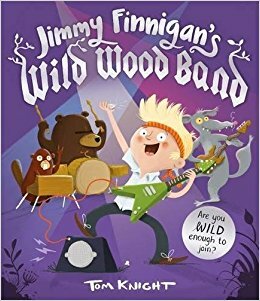 Despite the repeated warnings to stay away, frustration drives Jimmy towards the wild wood where he seizes the opportunity to follow his dream and play in a band with a wolf, a bear and a beaver. But his actions also have an impact on the villagers. We love the way that Jimmy changes his look from nice and neat to ‘rockstar’ as the story progresses, the humour in the illustrations portrays the change in the way that he does his hair and wears his school tie. We love Tom Knight’s illustrations and it’s hard to pick favourites. I love the pictures of Sergeant Marchant who, due to the low crime rate in the village, spends a lot of his time knitting for an unusual clientele!! My daughter loves the picture of the animals practising their different instruments, she especially loves the big bear who plays the drums. Jimmy Finnigan’s Wild Wood Band is a fabulous story to include in a school topic on music and instruments. Children could choose an animal and a musical instrument and paint them for a classroom wall display. Painting to music is a fun classroom activity and can really inspire children to get creative and feel the beat of the music as they paint. Thank you to Templar Books for sending this Jimmy Finnigan’s Wild Wood Band. We’re so happy that Jimmy’s dream of being a musician comes true! It’s a really fun story for showing children that music can help them express themselves too. We love the way that Jimmy’s music doesn’t just change his life…! I love it when music and books come together! Great recommendation – one for BookBairn to grow into! I hope that your son finds an instrument that he likes. Playing an instrument definitely changed Jimmy’s life in this story! Looks like a fun book and with such a positive message, too. Jimmy’s look gets wilder like the wood!! I did class painting to The Lion King once which was a mistake! The children all painted jungle pictures!! This sounds like a lovely book. It’s a bit young for my girls, unfortunately. Hi Catherine, this sounds like a fun book and anything that encourages a child to follow their dreams is a winner. It sounds like a fine example of not following the crowd too.